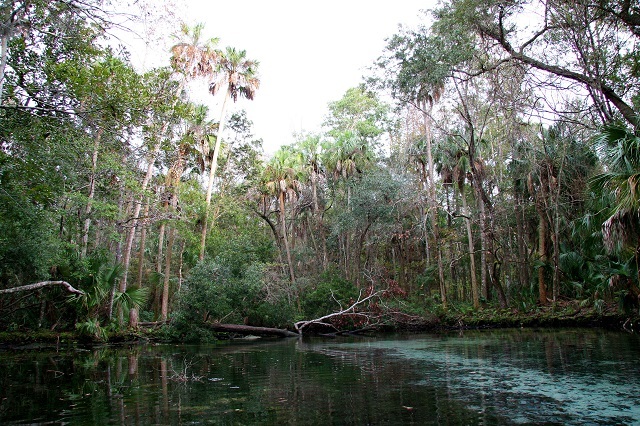 The Chassahowitzka River Trail is another outstanding birding and wildlife viewing opportunity for paddlers. Start at the Chassahowitzka River Campground and bird the hydric hammock around the parking area for songbirds in migration. Vultures roost in the trees across from the boat landing. Next, launch your canoe or kayak and head west towards the refuge. On the way to the Gulf, you will wind through hydric hammock, salt marsh and mudflats and barrier islands thick with wading birds, shorebirds, gulls, terns, Bald Eagles and more. Watch for alligators, otters, dolphins and manatees as well. Shallow water in some places limits the propeller boat traffic; airboats are sometimes present, however. Depending on your route to the refuge’s boat dock at Dog Island (the recommended turn-around point, restrooms available here), you will paddle between 3.5 to 4.5 miles one way (about 6 miles round-trip, counting the loop at the end). Take your time to enjoy the scenery, but allow enough time to return before nightfall.